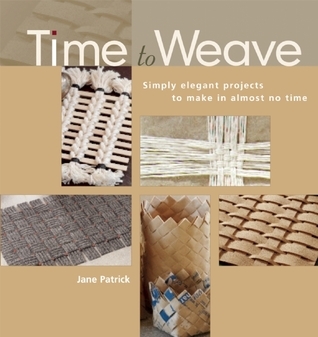 Time to Weave is fabulousI recommend this book for weaving on rocks, felt, and other fiber art projects! Very happy with this interesting book. WOW. Wow. wow. This book is very inspirational and reminds me of Erika Knight’s Simple Crochet and Simple Knits and a few other of the “simple” type books out there today. I have the want to weave bug, and I think this will fulfil it. So much so that on Friday I went out and bought a $7 roll of cork. I love how it’s not just standard weaving with a loom, but new and innovative ways and materials to weave. Additionally the braided rope had me drooling. This is most definitely not a book to read through over shabbat or yontif when you most want to start DOING the amazing projects. I know at MDSWF next Sunday I will be looking for a mini 4" loom. This book confirmed it. A VERY THOROUGH AND DETAILED EXPLANATION OF "WEAVING PROJECTS" WHICH DID NOT REQUIRE A LOOM.NOTHING I COULD USE RIGHT NOW BUT DEFINITELY FUN TO BROWSE.